I never eat Indian food in the summer. It just feels like a cold weather food to me, heavily spiced and rather rich, all in a good way. As soon as temperatures drop a bit, I’m ready for that over-stuffed feeling. My chef friend, Jen, recommended Delhi Palace 37-33 74th Street, Jackson Heights, NY 11372 so I expected the food would be good, and most of it was, but there’s something shady about this place. It was just Lon, me, and my dad and we totally over-ordered as usual. We shared a deliciously fresh and fruity Mango Lassi and a more un-natural Strawberry Lassi. These are filling drinks so I suggest sharing a mango lassi for every two people. The huge platter, “Tandoori Special”, highly recommended by our waiter, is probably enough for 3 people when you include the rice and naan (which come with it). The chicken is so tender and juicy, one marinated in yogurt and herbs, the other classic red. The Seekh Kabab, made of heavily spiced minced lamb, practically falls apart with the touch of a fork. 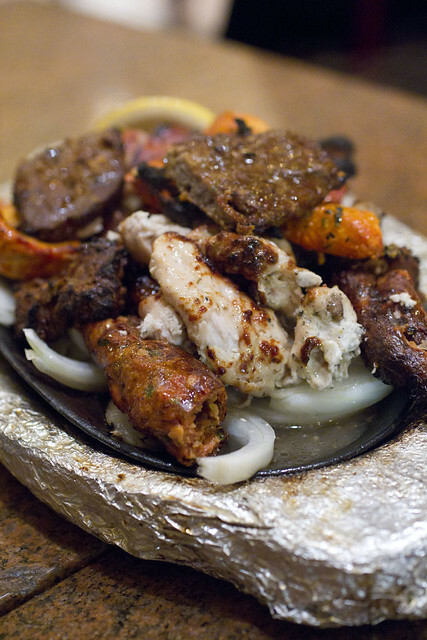 The Bihari Kabab, a thick slice of marinated lamb, ends up being tough and dry. I didn’t try the Tandoori Shrimp (again with my mercury limits) and the bed of onions works well with it all. Indian food isn’t that photogenic. It all tastes better than it looks. 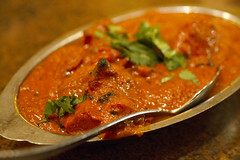 The Chicken Tika Masala had the vibrant tomato base without being overly sweetened. 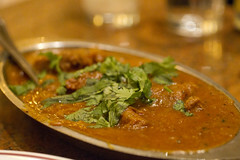 The Lamb Rogan Josh was earthy yet smooth. The Saag Paneer softly coats the tongue. Each is packed down with piles of basmati rice and breads. It starts getting shady when the waitstaff starts to tell us of the complimentary dishes they are giving us, a vegetable korma and some dal. Later when I reviewed the menu again at home, I found out that the tasty vegetables and milder lentil dish were both part of that “Tandoori Special” we had ordered. Still, I’ll admit that the food is delicious. Perfectly seasoned, fresh and hot, all well balanced flavors. Everything is above average with one exception, the naan. It’s good but not the main event it usually is for me. It was certainly fresh and warm but didn’t quite have the elasticity and alluring aroma of really great naans. 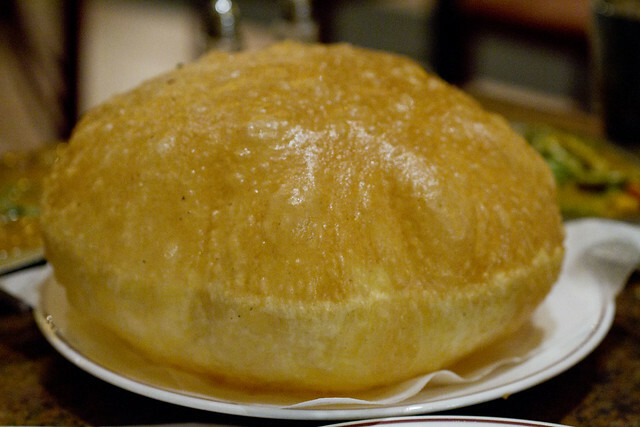 The Poori was better than most. Once popped, you could see the ultra thin crisp outer layer peel away from the softer inner layer, two distinct textures that pressed together. We wanted to take all our left-overs to go and while the waitstaff cleans up, they drop a spoon of sauce on Lon’s jacket. It’s a nice mess but seeing how nervous they were, we tried to downplay it. Still, I did notice that the waiter put the spoon from the floor back into the dish, the one we were taking to go. I go over everything in detail when I get home to write these reviews so I pulled out the receipt and then hopped onto their website for the menu. Comparing notes, I realized that we were over-charged. Lon calls them to find out why there was an extra $12 charged (it should have been $68.12 but we were charge $80.65). The gentlemen on the phone said it was a service charge so we asked why the $80.65 on the bill says clearly, “pre-tip amt”. Unable to really explain, Lon requests a refund on the extra gratuity we paid, $16. They are unwilling to refund it on the credit card over the phone so we have to return to the restaurant to collect the money. Going out of our way to get the money back was definitely annoying but we wanted to make sure they were actually going to refund it. 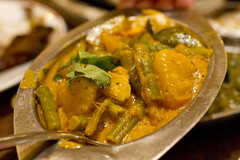 Anyway, the food at Delhi Palace is very good, but I”m not sure I’m comfortable with going back. Maybe the $7 lunch special…I”ll have to think about it. posted by jessica	at 06:10 PM	Filed under Asian, Basics, Restaurants. You can follow any responses to this entry through the RSS 2.0 feed. Both comments and pings are currently closed. I can have spicy food all year round! Steven, I don’t think I’ve been to Chola but I’ll put it on the list. pigpigscorner, I can eat spicy food all year round, like Szechuan or Mexican, etc. It’s just Indian food that feels exclusively winter-y to me. Anyone else or am I a wierdo? Oh yes, I am definitely calling you next trip I make to New York. Although I can eat Indian all year round, every day of the year. This food looks amazing. Well, they force you to go back but won’t that lead to just staying and eating there again? I love Indian food year round too, so even when it’s bad, I still think it’s delicious. 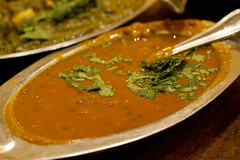 delhi palace is all about the chicken makhani. the biryanis and nans are ust alright. Jamie, we went back and just picked up the money, on our way to something else. Ashley and Steven, I tend to agree….I can never even shorten my ever growing list. daffyduck, I think that’s a big catch for me, the naan NOT being that good. That’s my favorite part of Indian food. delhi heights is my fav jackson heights indian joint. and their chicken makhani is even better than delhi palace. daffyduck, what about the naan? 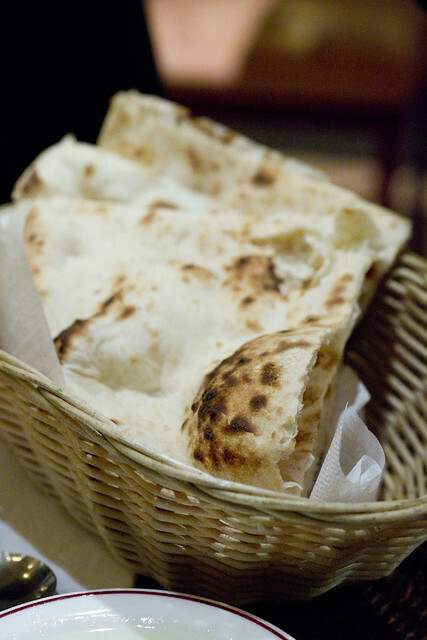 What’s your favorite place for naan? OMG Jen, I told Lon you recommended the dosas but then when we were ordering, we forgot. When we left, I got in the car and screamed, oh no! We didn’t get dosas. Anyway, we should meet up for lunch soon! that place has a lunch buffet on the weekend that has a CHAAT BAR. yep, you heard it. good stuff. sorry i didn’t get back to you sooner jessica. this site doesn’t alert me when someone. i like the nan at Delhi Heights and Kebab King Diner. I’ve heard great things about Southern Spice but I haven’t checked the place out. with kebab king though i would just stick to their tandoori items and nan. everything else is too oily for me. Thanks daffyduck, will try next time I have the naan craving.